About Victory Homes & Development, Inc. Victory Homes & Development, Inc. was established in 1996. Victor Yazbec, President and founder of Victory Homes & Development, Inc. has built many luxury homes in our local communities. He has most experience in high-end residential design and construction. He has established his company and it is consistently recognized as an award winning company. The Jacksonville Journal ranked Victory Homes & Development, Inc. number one on the Residential Builders List for three consecutive years and a number of other years. Victory Homes & Development, Inc. has also been a member of the Northeast Builders Association since 1993 and is an established member of the Better Business Bureau. 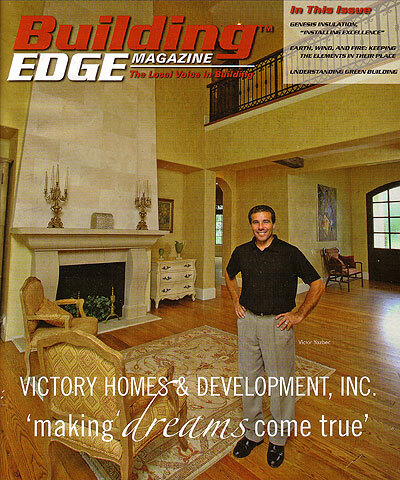 Victory Homes & Development, Inc. is committed to building the highest quality luxury homes. We at Victory Homes & Development, Inc. believe this may be accomplished with traditional methods and timeless craftsmanship. Combining state of the art building materials with almost 20 years of building experience, Victory Homes & Development, Inc. truly makes dreams and dream homes come to life.